The Monte Creek Ranch Winery is located just east of Kamloops in the new GI of the Thompson Valley. A region with cold winters, requires hardy grapes. Monte Creek Ranch has a variety of red and white hybrid grapes that can stand these winters. I talk about these grapes in the tasting notes for the wines. And they also grow Chardonnay and Pinot Noir. The winery has purchased land in the Similkameen Valley near Keremeos, where they will be planting Chardonnay and Merlot in 2018, so maybe in 2021 or 2022, we will see our first harvest of these grapes and subsequent wines. I’ve been tasting their wines for a few years already and I can say that the wines that they produce do taste different from the Okanagan as well as the Fraser Valley and Vancouver Island. In part due to the different grape varieties they use, and also I think the slightly warmer summer weather. Let me tell you about their latest Spring release of wines. 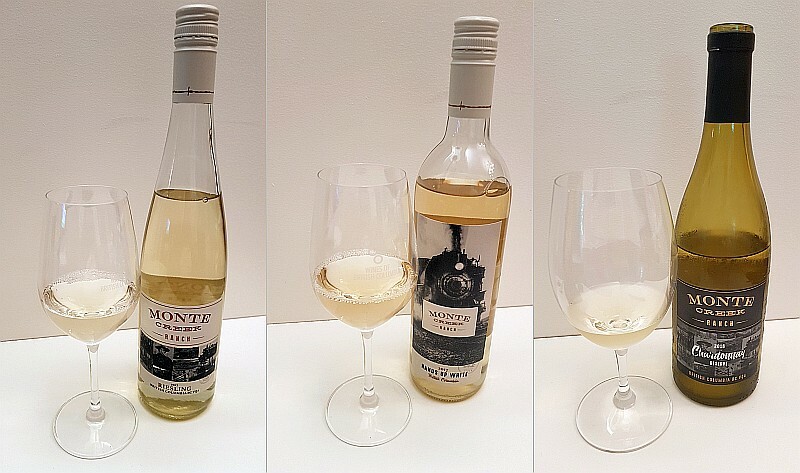 Monte Creek Ranch Chardonnay Reserve 2016 (Winery price $24.99) – Medium lemon colour in the glass. Medium intensity nose with aromas of lees, citrus, and light vanilla and oak. With decanting the lees component decreases and you get a note of honey. The wine is dry and round with medium plus acidity. Lees, roasted pineapple and other tropical fruits, citrus, in particular lemon, oak, and roasted apple flavours. There is also a touch of butterscotch and leafiness. With decanting the lees flavour diminished, the leafiness disappeared and the wine had a smoother mouthfeel. Medium plus length with some pepperiness on the finish. With decanting you pick up some butterscotch on the finish and the pepperiness diminishes. – Decanting helps open this oaked Chardonnay a bit adding a few more aromatic and flavour notes, and making it a bit softer. Monte Creek Ranch Hands Up White 2017 (Winery price $15.99) – A blend of 61% Frontenac Blanc, 23% La Crescent, and 17% Frontenac Gris. These are all hybrid grapes developed at the University of Minnesota and are cold tolerant, which is very useful for our cold winters in the interior of BC. This wine is medium plus pear skin in colour. It has a medium intensity nose with aromas of ranges, honey, pears and ripe, roasted pineapples, and a hint of banana. It is off-dry, round, with medium pus body and medium plus flavour intensity. Very ripe fruit flavours; pineapple, pear and Delicious apples. A hint of blossom. Spiciness throughout mixed with an acidic prickle on your tongue. Medium plus length finishing with mouthwatering acidity, tart tropical fruit, honey, pear skin and some green fruits. Also a bit of pepperiness on the finish. A unique white blend with a very thick round mouthfeel with lots of flavourful ripe tropical fruits on the palate. Monte Creek Ranch Riesling 2017 (Winery price $17.49) – I am partial to Riesling and this was my favourite wine of the lineup that I tasted. This wine has a medium lemon colour in the glass. Medium intensity nose, with aromas of lemon, lees, floral, pear, with a hint of green fruit behind. With decanting you get stone fruit aromas and some toastiness on the nose. The wine is off-dry with higher acidity and a thick, round mouthfeel. Upon first tasting this wine the salty minerality was the first thing I noted, but with decanting the minerality diminishes substantially. Primarily flavours of stone fruit and pears with a lesser amount of citrus, blossom and a hint of leafiness. With decanting you get a green edge; pine needle and toast. The wine has a medium plus length, finishing with mouthwatering acidity, tart citrus fruit, stone fruits and honey. The salty minerality picks up on the finish. There is also some pepperiness on the finish. I like this wine better without decanting, so open and enjoy. A good quality Riesling, medium bodied that has nice stone fruit and citrus aromas and flavours, and a salty mineral component. 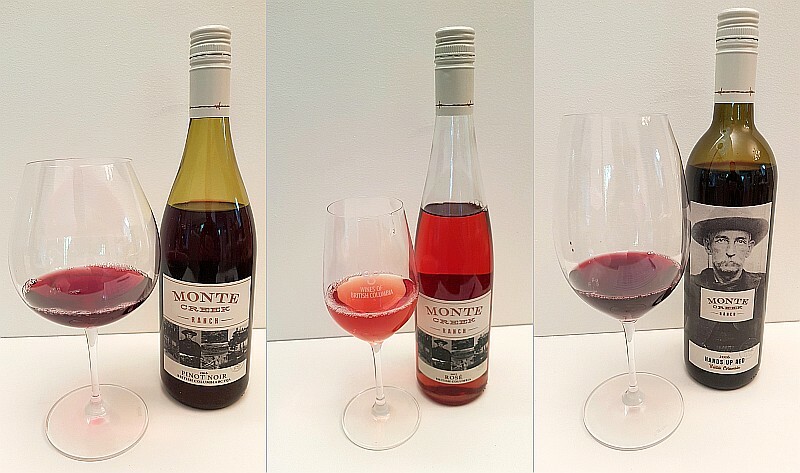 Monte Creek Ranch Pinot Noir 2016 (Winery price $19.99) – Clear, medium plus garnet in colour. Medium plus aroma intensity displaying toast, red fruits, tea leaves and bramble. With decanting the bramble becomes more pronounced. The wine is dry with medium acidity and lighter tannins. Medium body, round mouth feel. Flavours of tea leaves, red fruits, and raspberries, along with a floral edge and a hint of salty minerality behind the fruit flavours. These flavours continue with decanting. Also a hint of black currant leaves. Medium plus length finishing with floral, tea leaves and tart red fruit, with black tea tannic finish. The tea leaves become more prominent and floral less prominent on the finish with decanting. A pretty, elegant Pinot Noir with red fruits and tea leaves on the nose and palate. Decanting not necessary. Monte Creek Ranch Rosé 2017 (Winery price $17.49) – This wine is made with a North American hybrid grape known as Marquette. The grape was developed at the University of Minnesota and is cold hardy. This wine is medium intensity vibrant rhubarb colour with an orange tinge. Medium plus aroma intensity showing rhubarb, red fruits, and possibly a herbaceous note and some acetone. The wine is dry, thick and round in your mouth. Medium acidity. Tart red fruit and rhubarb flavours with steeliness in the background. Medium plus length finishing with tart red fruit, rhubarb and steeliness. With decanting you get some bitterness on the finish. Intense aromas and flavours for this Rose wine from Monte Creek Ranch. Rhubarb and red fruits. Monte Creek Ranch Hands Up Red 2016 (Winery price $16.99) – This wine is a blend of 82% Merlot, 8% Marquette, 8% Frontenac Noir, and 2% Cabernet Sauvignon. It is deep garnet in colour, but still translucent to the core. Lighter intensity, youthful aromas of red fruits, vanilla, and hints of toast and red cherries. With decanting, the vanilla and red fruits are diminished, and you get black fruit aromas as well as a hint of capsicum on the nose. The wine is dry with medium tannins and medium plus acidity. Medium body and medium plus flavour intensity. The medium plus acidity is not very noticeable due to the intensity of the fruit flavours and the heavier, round mouthfeel of this wine. Flavours of red cherries, raspberries, floral, and vanilla, along with salty minerality on the mid-palate. With decanting, the capsicum flavour becomes more prominent and you get black fruit flavours. The wine has a medium length, finishing with tart red fruit and floral; a bit puckering finish. Capsicum and dark fruits are stronger on the finish with decanting. I’d recommend drinking this wine as soon as it is opened. A round, heavier wine with red fruit and floral aromas and flavours that I’d recommend to try with grilled sausages. The higher acidity of the wine is hidden by the fruit flavours, but is there to balance out the fattiness of grilled sausages.